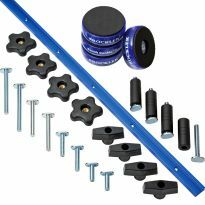 Outfit your workbenches, jigs, or machine tables with the ultimate t-track accessory! 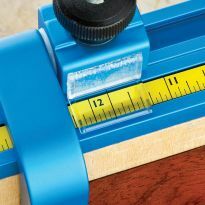 These Hold Down Clamps feature non-marring rubber tips that are ideal for working with soft woods, pre-finished panels, or anything that's already been prep sanded. The rubber clamp faces also help to grip the workpiece for better safety and accuracy. In addition, they have a wide aluminum body, allowing for maximum tension. 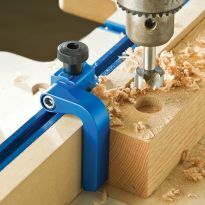 Clamps include a 5-star knob and a 5/16" T-bolt designed to fit into T-tracks on drill presses, router tables and more. The Hold Down Clamp, 5-1/2"L x 3/4"W provides the same great features as the 5-1/2"L x 1-1/8"W version, but in a slimmer width and without the non-marring rubber tips. Very good holding power and easy to set up. They work well on my CNC machine. The price was what motivated me to buy more. Have only had these for a couple of weeks. They are very well made. I’ve used them in conjunction with Rokler’s T track table to make a cabinet face frame and found them to very convenient to accurately join the components with pocket screws. They held the work pieces securely and did not mar the wood. I will be using them frequently. Get them while they are on sale. Love these...believe it or not, they work better than many of the others. While the form is nearly identical to other hold downs, the non-slip rubber contacts have worked better than the rest. I use them for a non track purpose, but the are well made. A bit pricey for what it is, but ok on sale. I use these hold down clamps on my Omio CNC router bed. They quickly and easily adjust to hold down the work material. These work great for holding small pieces on my drill press. A simple idea that saves time! Easy to use and holds your work where you want it. I was a machinist for over 25 years and we have been using clamps like this since the dawn of time. I would recommend the “ t “ track and these clamps for every one, you won’t be disappointed! I have made several homemade hold-down clamps and have been pretty satisfied with my own work. 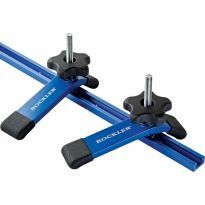 When I saw this Rockler hold-down on sale, I had to order one to compare to my own. It's a really nice clamp, with strong enough metal and a good rubber coating. If I wasn't such a DIY/frugal guy, I would order more of these. The only caveat is that they only hold up to just over 1+ inches in thickness. If you need much more depth, then you, like me, may be making your own. Works perfect with my cnc shark. Does what is supposed to. Works like a charm. I've got both sizes to use and they are great! these are simple to set up and are very sturdy in design. I use them every time I use my assembly table. These are the first set of these that I have purchased, and I was pleased to see how sturdy they are. I was expecting thinner material. These are great. Made our own t-slot board for our CNC and these clamps are awesome. They are well worth the money going to have to buy more ! Used two of these on the drill press table I build and it holds the stock firmly for a no hands hold while drilling. I've also added these to my. 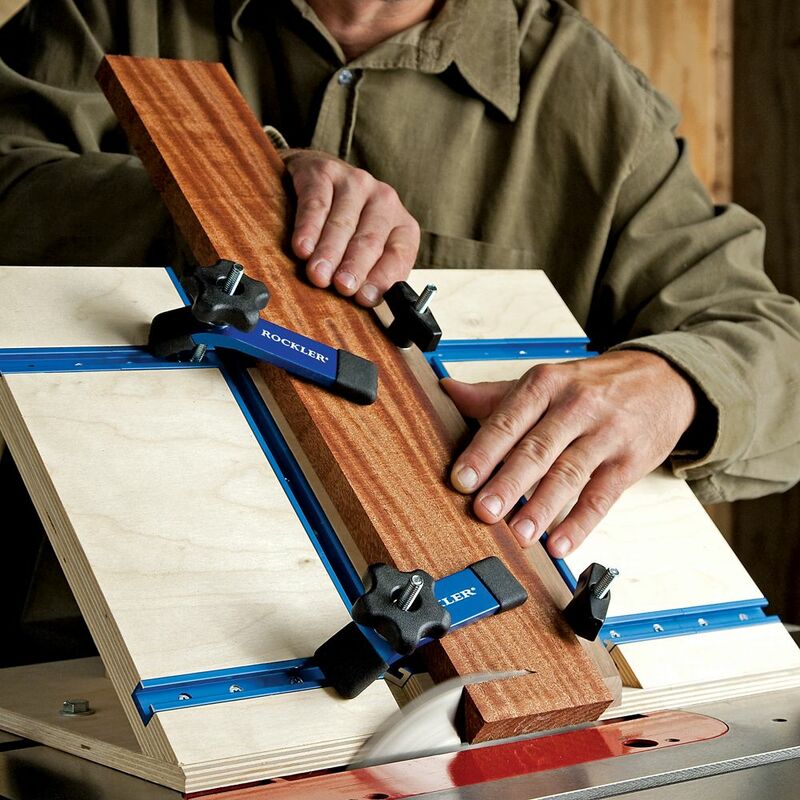 table saw sled for safer cutting of small parts. Great product. Especially like the simplicity. 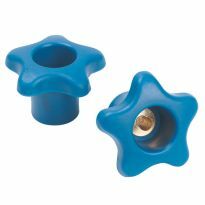 Other brands of hold downs have an additional cylindrical piece between the bar and the knob which also works but it is harder to set up. Simple wins out. 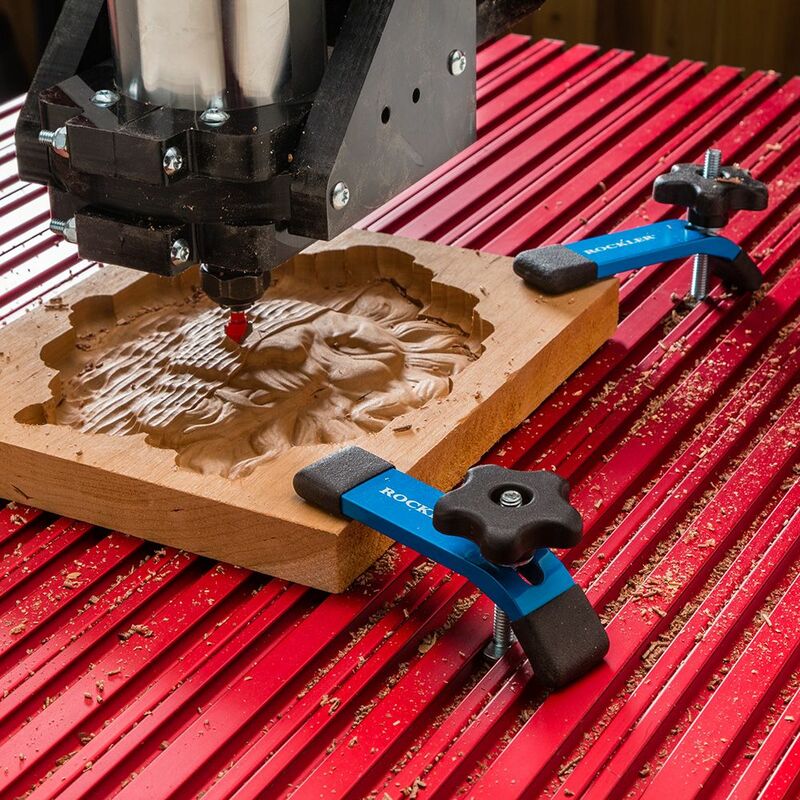 These are great for CNC hold down. The rubber is sturdy on the ends. Easy on the wood. Won’t slip around. Works well, like rockier products. Bought to work with small sled to lock down wood pieces being cut. Every person who use the T-track system needs this hold down. Great safety item. Works great for what I wanted it for. Great product!!! Clamp is real handy. It is better than maneuvering a C-clamp. 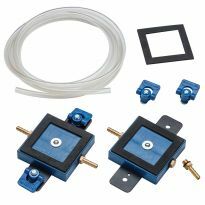 I wanted to purchase two more hold downs for my HD4 CNC machine. These use the same T bolts as the ones that came with the CNC. Therefore they were exactly what I wanted. Great clamp for any t-slot equipped workspace. Easy and fast with excellent support. 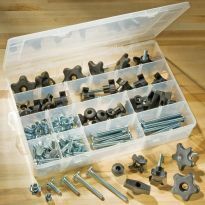 I use these on my CNC machine to hold down work material. Quick and easy reliable work clamp I recommend for any CNC owner. Can't beat 'em. They're great. Recommended for everyone. Quality product, easy to use. Very easy to use. I use these on my CNC table. I purchased these at the same time as some T-track. 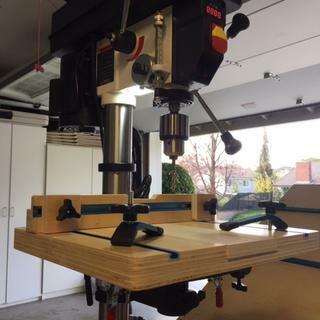 I employed T-track on my home-built crosscut sled and home-built drill press table. This is such an easy clamp to use and allowed me to safely and efficiently make cuts on small pieces on my CC sled. I easily move the clamps between the CC sled and the DP table. I recommend them to anyone who uses T-track. Purchased for cutting small parts on my cross cut sled. Very satisfied with performance. Great clamps, haven't had any problems with my work pieces moving on my CNC table. Much better tha woodpeckers clamps. I might recommend buying the longer t-bolts to hold thicker wood for CNC machines. Getting ready to build a drillpress table and want these to serve as hold-downs. They look great and are more reasonably priced here than other sources. Wanted to get them while they were on sale. Needed clamps and they were on sale! I saw another person use these. To use on a jig. My husband needed these for a project. Bought 4 to secure materials to work table. They appear to be very easy to use and to be used in a variety of applications. It's what I saw James king use on his cross cut sled video. Something that my husband says he can use in his woodworking projects. 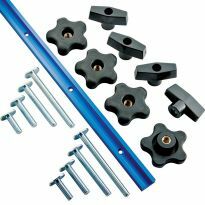 These are terrific hold downs for Rockler t-tracks. To use on the usual t-tracks just change the bolts. Need a way to hold work safely on my new cross cut sled. Adding hold downs to fit in Tee track on a new home built drill press table. On-sale and a good value. I ordered before and very high quality and works very well. Always wanted some of these for my shop. The sale was just the bonus. These are so handy work great! Making a cross cut sled. I chose these for their intended purpose. They work well, as expected and the sale price is a no brainer. Need to know the split dimensions - from the bolt to each end (from bolt CL to short end and to long end). Would someone mind measuring and providing those? Thanks. BEST ANSWER: 4 3/8 inches and 1 1/2 inch on the larger clamp. 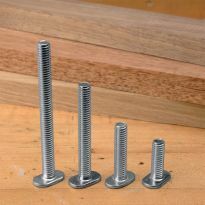 Will these t bolts work in Incra's t track? I use 1/4" hex bolts now. BEST ANSWER: The part of the bolt that would be in the track, (a flat oval shaped pad on the end of the 1/4-20 threaded rod) measures 11/16 L x1/2 W x by 3/32 inch thick. I don't have an Incra track so I couldn't say if it will fit. If a 1/4" hex bolt head fits I suspect this would too. If not you could always use the hex bolt with this clamp arm. I am not familiar with Incra track, but the Rockwell clamps use 5/16-18 bolts with heads that are just over 1/2" wide (.518). That's larger than the 7/16" width of the 1/4" bolts you are using now so you'll have to measure to see if they will fit. Thickness should not be an issue, as the heads are thinner than a standard hex head. Incra tracks take 1/4x20 bolt heads in the T track so yes, that should work fine. BEST ANSWER: You need a grove for the bottom ( head of screw) to slide in. 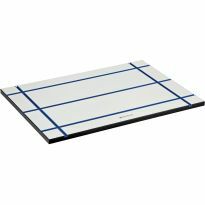 Ideal for holding a board tight to work surface when sanding or routing. You will find many uses as your skills improve. Suggest you buy at least two clamps. T track clamps, Thinner and thicker stock. Would this fit the t-tracks on a desktop shopbot? BEST ANSWER: It should. I worked at Rockler for a year and sold seneral of these for CNC machines. Including my own. 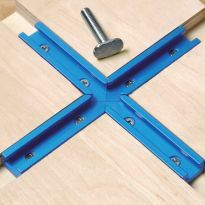 I don't know, I don't have a "shopbot", but if it has the standard "T" tracks, it should..
Can this clamp be used on a table saw in the miter bar slot by replacing the t-bolt with the screw in the miter bar hardware kit? BEST ANSWER: You could attach it to the miter bar with the right thread size and length. I have never tried this however and am not sure where the clamp pressure would be applied. It would need to be over some part of the miter unit to hold the work piece firmly. If the clamp is in the wrong position you end up pressing onto the table itself which wouldnt accomplish anything. No harm in playing though. I don't think that it will work for that. I can't think how you can make it work. 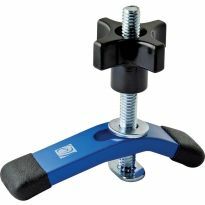 Will this clamp work with 1/4-20 hardware (T-Bolts and knobs)? BEST ANSWER: Not knowing exactly what you intend to clamp, I will give a conditional YES, this clamp will work with 1/4-20 hardware, with the caveat that it be light to moderate level of clamping. I tried it on my drill press system just to be sure and I was able to give sufficient clamping force to hold the object being drilled using 1/4-20 bolts and knobs. Due to the size of the slot in the clamp which is sized for 5/16 hardware a 1/4" flat washer between clamp and knob was necessary but otherwise everything worked just fine. Brian, thanks for the info. 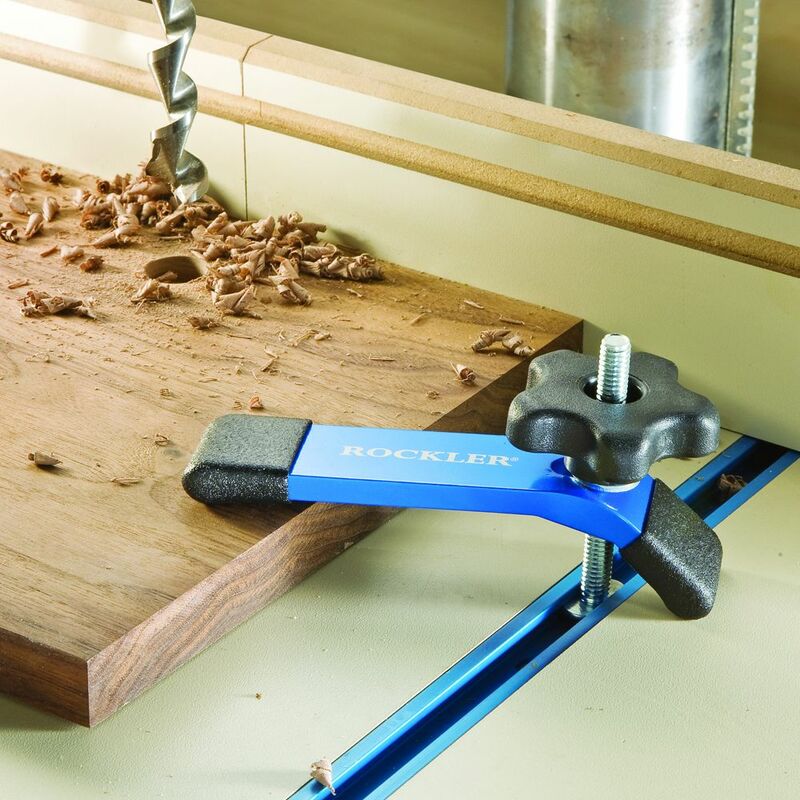 Based on what you say my guess is the Rockler clamps you are looking at will work just fine. Good luck! It sounds like fun. Both their hold down clamps come with 5/16" x 18tpi bolts. But, the design of the clamp is such that the Tbolt passes through a slot cut into the bar of the clamp. So you can simply remove the supplied Tbolt and knob and replace it with a 1/4x20 bolt and knob if you wanted. Thanks David - wasn't sure if the 1/4-20 hardware would be too loose in the slot. 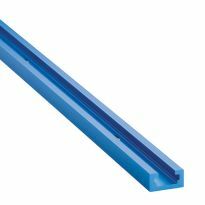 will these fit a kreg router tables' T track? BEST ANSWER: The tab that fits in the slot is 3/4 ths of an inch long. This is too short to work in my router table extension on my table saw. if the Kreg slot will take the 3/4th length, it should work. It works fine on my Rockler work table surface for which it was designed. Hope this helps. Will these fit my 1/2 inch Jet drill press production table t slots? I bought them anyway to see. They kind of don'the fit any of my tools equally. I have a Canadian general 650 tablesaw, and this has the smallest t slot of any of my tools. It likely fits this the best as is. The t bolt allows it to be inserted at any point along the track, turned 90 degrees, held and then locked. If not held it spins around until loose while you tighten at the top, and doesn't lock in place as they do in rocklers own track. (They insert lengthwise and snugly fit). On my jet drill press, the bottom slot size is a full 1 inch, and I had to drill out washers to go above the t bolt, as the top t opening on the table was way too large to realistically balance the bolt in there. With the 1 inch washer above the t bolt, it works very well, and doesn't require the holding while tightening thing. On my Laguna bandsaw, the depth of the t slot, while the same width as the drill press, is a lot shallower, so really, neither the washer solution or by itself worked very well on this one..One is too loose, and one jams up. So.. hrm, I think I'd be better off figuring out a different bolt/washer combination and replacing the rocker ones, so they can be moved from machine to machine.. or just buy another couple for the saw, and leave the washers in place and dedicated to the drill press. Though it isn't too much bother to disassemble. I don't have a lot of need for any on the bandsaw anyway, so that's fine. What size is the t track?